Helping residents adapt to this summer's drought, the Mar Vista Green Committee is co-presenting a Wise Water Use Expo at the Mar Vista Recreation Center on July 21st at 6pm. 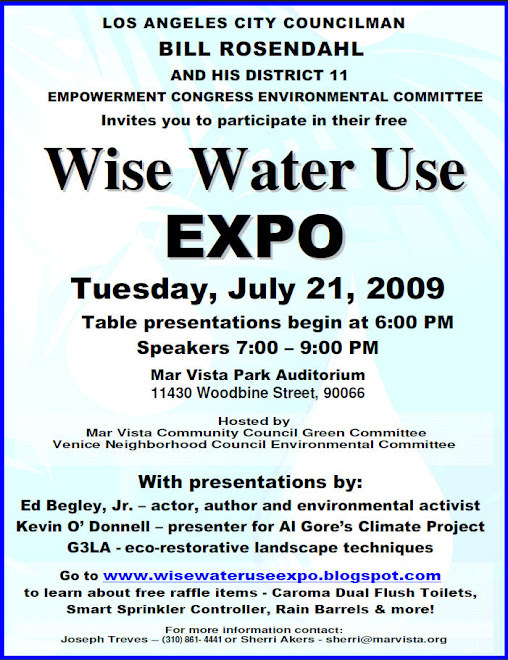 The event is co-hosted by the CD11 Empowerment Congress Environmental Committee and will include guest presentations by actor, author and environmental activist Ed Begley, Jr.; Kevin O'Donnell, a sustainable design strategist from Al Gore's Climate Project; and Green Gardens Group LA (G3LA). Give aways and water solution raffle items will include dual flush toilets, a smart sprinkler controller, a rain barrell, and a tote bag filled with eco solutions. The Council District 11 Empowerment Congress was organized by Los Angeles City Councilman Bill Rosendahl to bring together the genius, the energy, and the commitment of neighborhood leaders.